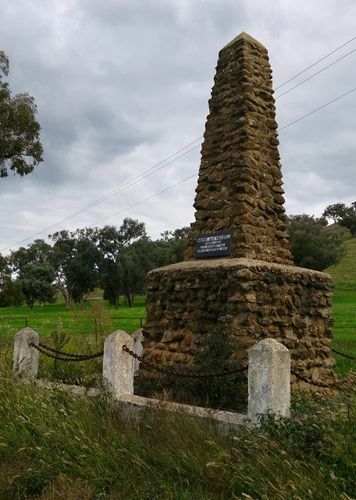 The cairn commemorates the centenary of the Hume and Hovell expedition. The cairn was unveiled in 1924 near the Ebden station. The explorers had reached this spot after much difficulty in amongst the swamps and lagoons. Considerable interest is being manifested in the excursion to Ebden on Tuesday next to inspect the cairn at that centre. The unveiling ceremony will be performed by His Excellency, Lord Stradbroke at 3.30 p.m. A special train will leave Wodonga at 11.45 a.m., picking up passengers en route. No charge will be made for children, but adults will have to pay a nominal fare. The return journey will be made at 4 p.m., so as to enable local residents to attend the unveiling ceremony at Wodonga. A public holiday is being observed throughout the Wodonga, Towong and Yackandandah shires, so that an enormous crowd should be in attendance. Persons intending to make the trip are requested to make their own arrangements for eatables, but the Ebden committee will provide hot water and milk. Particular attention is directed to the alteration of the times for unveiling at Ebden to 3.30 p.m. and at Bethanga at 4.30 to suit the convenience of His Excellency. At 5 o'clock the same afternoon the unveiling of the Wodonga and District Soldiers' Memorial will take place. Lord Stradbroke will officiate. Wodonga and Towong Sentinel (Vic), 14 November 1924.